After only the briefest of stays, in three port regions scattered across the western shores of this vast land, it’s impossible of course to give a fair accounting of a sprawling country of 1.3 billion, with a rich history that spans millennia — from before recorded time to today’s headlines. What is possible however, and what I’ll attempt in this and two following “postcards”, is to share a tiny sample of impressions and refractions from images captured and notes taken during my time in Cochin, Mangalore, and Mumbai India. India’s is a history comprising both the actions of a highly varied indigenous set of peoples, and the numerous layered footprints of cultures from afar, with the passing centuries bringing influence from Arabs and Persians, then Europeans… and now from the inexorable forces of globalization. What Ellie, our fellow travelers, and I experienced during our several landings was thus an assembly across time, blending cultures as they were across various ‘thens,’ crafted by many hands. These visits, our first to the sub-continent, accomplished for me what one hopes for through such an undertaking: the immediate visceral experience of wonder, leading to passing phases of disorientation and confusion, on the way to humility, respect, just a bit of understanding, and an opening up of personal perspectives. That is how our guide introduced herself as the coach pulled away from a dock area on Willingdon Island, an artificial patch of land reclaimed from the sea with soil dredged from the adjacent waters by the British in the course of creating a deep sea port here in 1936, in what proved to be a final contribution to local infrastructure, a bit more than a decade before handing over the keys to the place and all that surrounds it. Anija explained that she is Catholic, married with two young daughters, and chooses to live in the Hindu manner of dress, adornment, and lifestyle. She was a delight. Cochin (alternately ‘Kochi’) is in the state of Kerala, in the SW corner of India, on its Malabar Coast, facing the Arabian Sea. It was one of the key stops along the maritime Silk Road (more popular than its land alternative – with its forbidding deserts, and its nasty warlords, with their less than hospitable habits). 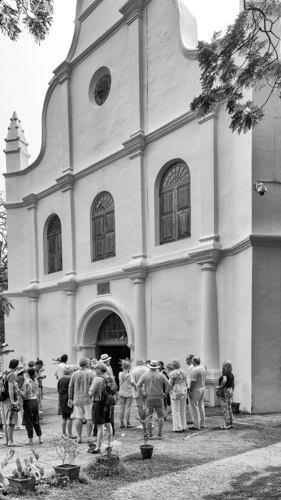 Arab traders, then the Portuguese, then the Dutch, and finally the British, all played a hand in shaping Cochin’s history over the past thousand years. Their respective influences are all still obvious today, sixty-eight years after India achieved its independence. Kerala came together as a state in 1956, through a combination of adjacent kingdoms sharing a common language, Malayalam, one of over a hundred spoken across India. While later pushed aside as a custom by the British, for centuries the local peoples followed a matrilineal system, with true power (and wealth) passing through the woman’s side of families, ruling or otherwise. This had the effect of diffusing wealth, rather than concentrating it – a dynamic more recently carried on by the strong role of the local Communist party (one of two that contend for control in the state, and the first popularly elected communist party worldwide). Kerala is isolated from the other 28 states of India by the sea to the west, and by surrounding mountains to the north and east. Perhaps as a direct consequence of all this, Anija explained, with no small amount of pride showing, that Kerala is very successful and progressive, boasting a largely middle class and prosperous society… one leading India in important areas such as women’s rights, sanitation, education, literacy (nearly 100%), population control, and the sweeping away of the caste system. The climate, with its two monsoons separating hot and hotter seasons, favors hardwood production. Teak forestry of highest quality is a major source of revenue, and its management is reportedly well controlled. 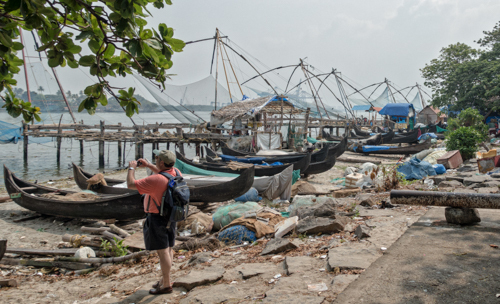 Thoughts of all of this were fresh in mind as we arrived at our first stop – a fishing village and market in the old section of Cochin (“Fort Cochin”), just across a waterway separating it from our port. Huge cantilevered fishing contraptions, ones that would have made Rube Goldberg proud – with their weights, pulleys, and means of human control — were on offer as the featured attraction. The current theory is that their design came from China via the agency of Portuguese traders based in Macao. Today, they are a source of livelihood for locals, both as means of harvesting a catch, and as a tourist attraction. In order to secure the benefits of the primary purpose, we were told that the fishermen need to be swift in recovering a net’s worth of fish, lest the crows make off with it. The latter value is tapped by insistence that tribute be paid in order to secure the best vantage points for photos, and by local vendors gathering to hawk to tourists. 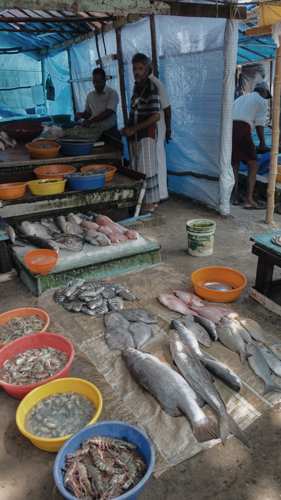 A short walk from the nets leads to a small fish market. Hopefully, that proximity, and a roughly matched rate of production and consumption, makes up for the absence of ice. For the adventurous, nearby restaurants are available to prepare your purchase. We demurred. 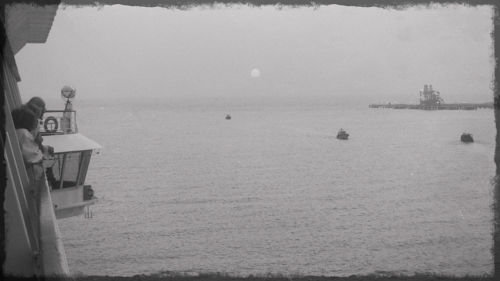 Only a short distance onward, and serving as more direct evidence of local influence than their reported role as carrier of Chinese fishing technology, lies St. Francis– built by the Portuguese as the first European church in India. (But not as the first arrival of Christianity – that occurred when St. Thomas (doubts now quelled) arrived in 52 AD. Aside from its primary distinction of tenure, the most notable fact about St. Francis is that the explorer Vasco da Gama used to be buried there, before posthumously decamping for Lisbon. Next most notable: the Punkah fans hanging above the pews of this still-practicing house of worship, but no longer operational – a status formerly accomplished by poor soles pulling cyclically on ropes extending to the sweaty tropical exterior through the stone side walls of the building. This running service outage is reportedly due to a sharp decline in the number of persons inclined to serve this duty (and undoubtedly by the installation of rotary electric fans just above). Before the Portuguese bowed out, at the suggestion of the Dutch, they had a run-in with a certain King Veera Kerala Varma, following the destruction of a local temple. Seeking continuation of friendly relations, they built the next stop on our tour of Cochin: what is now the Maharadja Palace Museum… then an abode for said king. 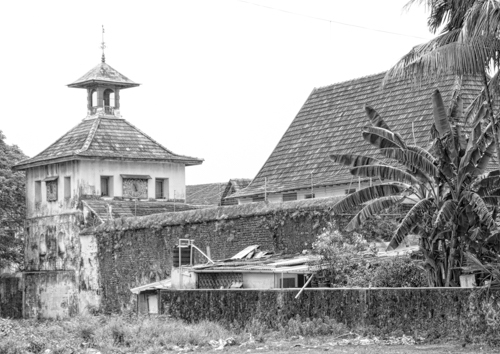 The monarchical rulers of Kochi used the compound for generations… but times change, and their descendants now live in humble circumstances, “as ordinary people, somewhere just outside of town,” according to Anija. On the way, Anija elaborated as to how groups of Jews from afar were warmly welcomed by local kings and their peoples for centuries… a reality that met a harsh reversal in Portuguese times… but was reinstated later. A local Jewish population of several thousand grew, here and in neighboring regions – but has since shrunk to what is reported to be a remaining group of seven souls. Not seven hundred. Seven. Anija attributed the decline to the self-imposed isolation of the community, its small size, and the resulting realities of inbreeding on health and welfare. The former homes of the thousands have now been converted to shops, scattered across the quarter of town that bears the name of their faith. We shopped a bit (I delegated that to Ellie, but hugely enjoyed the spice store’s air conditioning)…then moved back through the thick late day heat to the coach, and then to the ship for a departure at sunset. In these few hours we were given a basic sense of this place: its land, its layered history, its people, politics and culture, and something of its character — glimpses only to be sure — but enough to leave us looking forward to more in the days ahead. Posted in Asia, Current Affairs, History, People, Places, Travel.